I love blueberry muffins. I’m sure I’ve told you that in the past. But, back in my childhood, there was nothing blueberry in the UK at all! I had to travel to Edinburgh into Jenner’s Food Hall before I got my hands on a large tin of blueberries, shipped from the US at some exorbitant cost! Slowly, but gradually, blueberries did filter through into UK life. I remember blueberry Hubba Bubba (It was the 80’s), blueberry soft-drinks and thankfully Blueberry Muffins courtesy of a Mrs B Crocker and her packet mixes. I loved those packet mixes – opening the can of little highly fragrant berries and stirring them through the prepared batter. In hindsight, the blueberries were strangely tiny, which I discovered again recently, after buying my first pack of blueberry muffin mix in a very long time. Don’t worry, I’m not just going to whip up a batch of boxed muffins. I am making these into biscotti, the hard, crunchy biscuits which are perfect with a cuppa. I love taking boxed cake mixes and making them into other treats such as cookies or cake batter bark. I saw a recipe on the Nestle website, which used a box of blueberry mix to make these. But they added white chocolate chips as well. How about just the packet mix, unadulterated, twice baked into a crispy cookie (for biscotti translates as twice baked, as we all know)? Actually, in America the packet mixes must come in huge sizes. I had to severely adapt the recipe to accommodate the rather less plentiful packet sizes we get. Still, it made a lovely toasty biscuit, with all the taste you would expect from a blueberry muffin. Pre-heat the oven to 180C and line a baking tray with greaseproof paper. Drain the can of blueberries, reserving the liquid. Absorb any excess liquid from the blueberries with a piece of kitchen paper. In a bowl mix together the cake mix, flour and butter. Use your hands to rub the butter into the dry ingredients. It should resemble breadcrumbs. Add the egg and mix through until a dough forms. Add the drained blueberries and mix through, using your hands if necessary. Don’t worry if the blueberries squash up a bit. Transfer the dough onto the baking sheet and form into a thin log about 2 inches wide. Bake in the oven for 25 minutes, then transfer the log onto a cooling rack, for one hour. Turn the heat down to 150C. After the hour, with a serrated knife, cut the log into slices about ¾ inch thick. On a new piece of greaseproof paper, on the baking tray, stand the slices upright and carefully place into the oven for 20 to 25 minutes. You want the pieces to slowly bake and almost toast. They should turn lightly golden brown, not burn. Remove from the oven and allow to cool fully. Mix the icing sugar with 2-3 teaspoons of the reserved liquid from the can of blueberries and mix into a drizzling consistency. Drizzle over the cooled biscotti and allow the icing to set. Enjoy your biscotto with a cuppa! I'm entering these biscotti into this month's Biscuit Barrell, hosted by Laura at I'd Much Rather Bake. The theme is winter warmers and blueberry muffins to me are so cosy and comforting and in biscuit form even more so! I love the way blueberry muffin batter smells it's so intoxicating! I bet these smelt amazing when you were baking them! They did Lisa - I always have loved that smell too. Fun glad I'm not the only one who uses premise mixes sometimes. These look great! 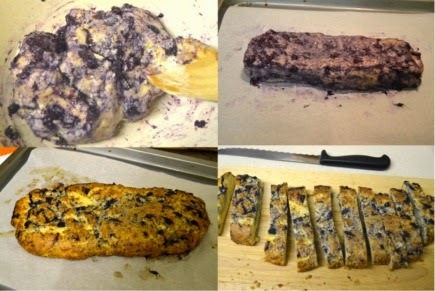 I always enjoy making biscotti but I don't usually add butter; they keep for longer without. Perfect in a pretty bag with ribbon as a Christmas present! Fab colour! I've never used a pre-mix thingy before, should I? Mmmmmmmmmm. These look incredibly delicious and so inviting with that drizzle to finish. They are just the thing I would be reaching for over and over while I drank my tea. 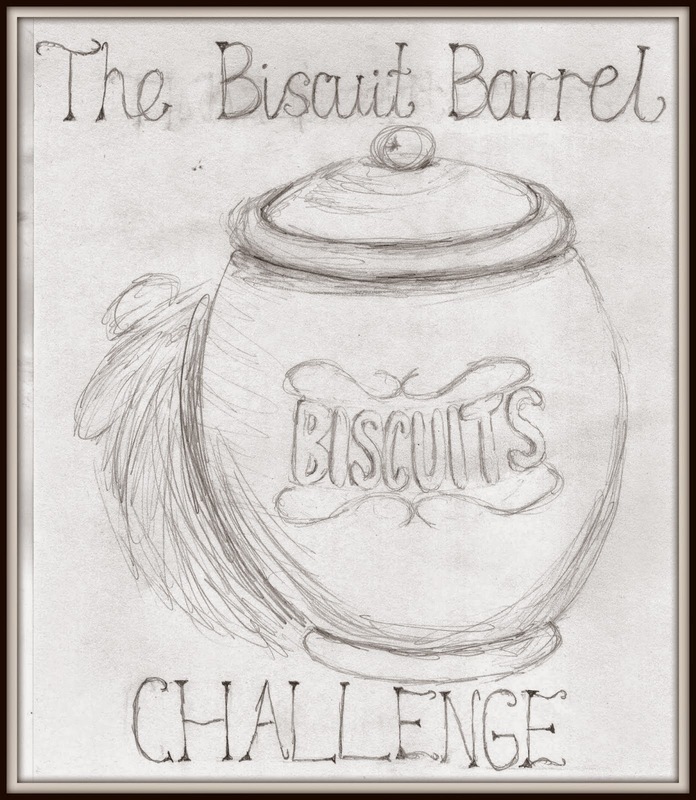 Thanks for sharing with the Biscuit Barrel!